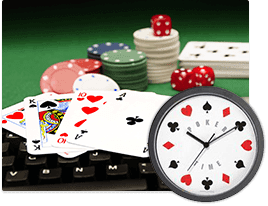 Odds are if you are reading this, you are well past any assumptions about poker being a game of pure luck, and have probably made some decent progress on your poker journey. But there was probably a time when you didn't even consider studying poker. You probably overestimated your abilities, played way too many hands, and maybe even had a few superstitions. As we all find out eventually, nobody is "born a winner" when it comes to poker. Phil Ivey himself went broke several times when learning how to play poker before he really got the hang of it. But what is the best way to go about studying and learning poker? There're a number of traditional ways that people go about learning how to play poker. But before you jump into deciding how you want to devote your study time, you should consider what you actually need. Recall back to when you were first learning how to play poker. You probably had to be reminded that a flush beats a straight, that it was your turn to bet, and that a red chip was worth $5. 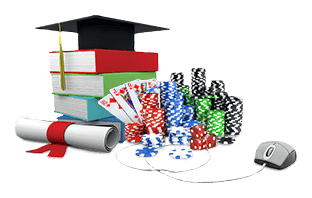 You probably wouldn't have benefited so much from reading an advanced poker book or watching videos on a poker training site. Similarly, you are probably now at the point where you don't need a hand ranking chart to figure out which hand wins after the river betting is complete. With that in mind, let's explore some of the options out there that can help us learn how to play poker better. 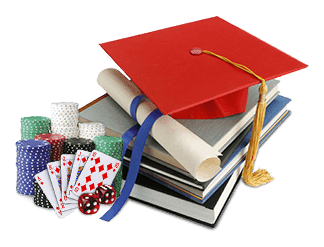 Poker books, though not as prevalent as they used to be, are still leaned on heavily when it comes to poker learning. Most poker players who take the game seriously own at least a couple poker strategy books, and some have enough to rival a library. It's probably not going to be the best choice if you're distinctly not a "book person," but books have a couple of advantages. For one thing, they are a one-time cost - you pay for the book and can continue to go back to it over and over if you want. You may even be able to get them for free by utilizing your local library. Books are also nice because it's pretty easy to take them around with you and use them anywhere: on a commute, on a trip, or in your home. The one biggest disadvantage to books is that they are "out-dated" in a number of ways. Visually they have some limitations (no video, and limited effectiveness of pictures), and they cannot utilize audio, so may be less useful to aural learners. 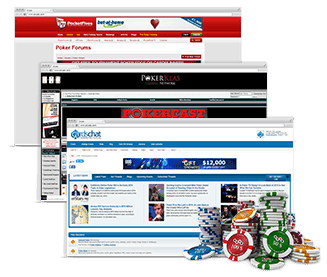 Poker training sites first started gaining traction because of their effective use of video media to teach poker concepts. 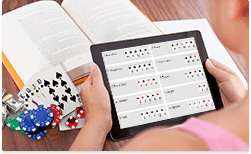 The format became the most popular way to learn poker from then on, in part because it surpassed boundaries that books couldn't, and in part because they could combine poker learning with entertainment. 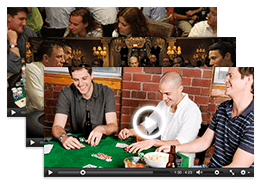 Successful or well-known players quickly began filling this market, and there now exist many poker training videos for free and for purchase. Videos are great because they can be effective learning tools for many different types of learners, and because there are so many options. The variety available means you can easily find something appealing to you - there is something out there for virtually any concept, and for all skill levels. Plus, there are a number of free resources out there such as on Twitch, so if you don't have a big bankroll, you should still be able to find things within your budget that will still be useful to you. 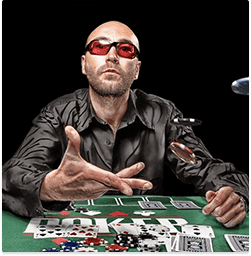 Most modern, recognizable professional poker players these days cite the players around them as being integral to their development as players. Having people around who can relate to your experiences in this often misunderstood past-time is crucial. Whether it's discussing hands you've played, dissecting poker concepts, or just generally supporting you, having poker friends is an important part of most serious players' poker lives. Poker forums like CardsChat combine the strengths of a couple of the above methods of approaching poker learning. Most forums contain explicit strategy sections that contain articles like this one, written on a variety of topics. But in addition to this, there is a social aspect to poker forums. Members can post threads with their questions in a number of sub-forums. 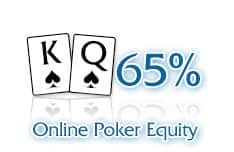 Requests for hand analysis, general strategy questions, and interest in forming study groups all coexist in poker forums, with the most relevant topics typically receiving many replies. There are so many differing opinions that it can be hard to sift through the bad to get to the useful. There tend to be lots of "flame wars". Many a thread have become all but unsalvageable because two or more participants have become so invested in the debate that the conversation has devolved into name-calling, insult-hurling, and general chaos. This aspect of forums is kept at a reasonable minimum at CardsChat though, where most threads are both fun and productive. On top of the learning that occurs at CardsChat, a community has developed, with open freerolls helping to bring in new members, and member-only events helping bring members together in a way that is both enjoyable and beneficial to their growth as poker players. There are other social aspects to forums that are often overlooked as well. 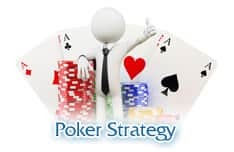 Sometimes when small groups develop amidst a poker forum, those players start to keep in touch off the forums - usually via chat rooms where they can talk poker strategy and lower-key topics in real time. This ties back into the Poker Friends section. These off-forum discussions can lead to some of the most enlightening a-ha moments because they require critical thinking as well as communication skills to help convey opinions in a reasonable way. Whatever the need, poker forums have a lot to offer toward meeting that need. Getting coaching is something that everyone seems to have an opinion on. Some people think that most coaches are not worth the money, and in a lot of ways they can be correct. However, this isn't true in all cases. Coaches can help take your game to the next level, increasing your earn potential, and your enjoyment in the game as your improvement creates new excitement. There are some caveats to watch out for, though. First, understand your ability and your budget: you're not going to hire Phil Galfond if you're trying to make the leap from 25nl to 50nl online. Similarly, you probably shouldn't hire a small stakes grinder if you're looking to break out of mid stakes into high stakes. This brings us to the next important thing to think about. Coaching is most likely to be useful when you've reached an apparent ceiling in your ability. It doesn't have to be when you're on a downswing or anything bad, but it will often be a good idea when you are struggling to move up, since this often signifies a skill gap between you and the next level up. Having a coach evaluate your thought process and push you to think more deeply about the game can help you develop your edge further and move you up. Probably the worst aspect to coaching is that there is an inherent danger of getting ripped off. Again, I don't want to imply that all coaches are over-priced, or that no coach is hirable at a reasonable cost, but it's an important thing to keep in mind. There have been a number of small semi-scandals in the poker community revolving around coaching. Just remember to do your research if you are considering getting coaching. Big names will often be safe bets, but they will be pricey. Lesser known players will tend to be much cheaper, but make sure you are getting reliable references from them. Another thing to pay attention to is playing and teaching styles. You and your coach must be compatible for anything useful to come out of the coaching. Consider asking for a free or discounted session to see if the two of you may work well together, and never feel obligated to continue a coaching relationship if you don't feel you are getting enough out of it. Lastly, if you are thinking about hiring a coach but are still struggling at some of the lowest limits, you should probably consider looking into some of the other learning methods out there first, as they will be much cheaper. Additionally, it can be difficult for a coach to help you out in a meaningful way if you are struggling with the fundamentals, or to beat the nanos or low micros. "I'm not a math person." This is almost cliché coming from the mouth of a poker player, because so much of the game is dictated by math. Probability, odds, equity - these concepts are all deeply embedded in a foundation of mathematics. 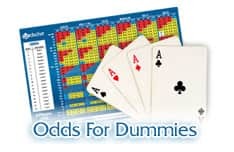 On top of this, most poker math that is useful to you in-game is quite simple and can be easily learned by anyone of any age or mathematical background. That being said, some pieces are going to be more useful than other pieces. Here is a list of the most important (and easiest) mathematical parts of poker you can learn, in the order you should learn them in. It's hard to play poker if you don't know how many cards can help you and how frequently those cards will come. Being able to know how often you win a hand and translating that into a dollar amount is how we "keep score" for how we played a poker hand in isolation. Once you start to become a strong hand reader, this will help you create an accurate idea of your equity in a hand. If you are ever playing against highly skilled players or in a spot where your opponent is unlikely to make a mistake, an understanding of game theory optimal play will help you to prevent your opponent from exploiting you. Understanding unexploitable play will also allow you to exploit others more effectively. Probably weeks at the minimum for anyone who is new to game theory to learn the basics of what it means. Longer to begin applying this to poker in a meaningful way. Far longer to begin utilizing it in one's play regularly. While all players should pursue a working understanding of outs, odds, equity, and expected value, combinatorics may cross the line for some, while game theory is something that will likely only be particularly useful for those looking to become expert players and play in highly difficult games. This is perhaps the most difficult question to answer when it comes to learning and studying poker, particularly because it's so individual. Different players will need and want to study different amounts, and this is to be completely expected. Some pros recommend studying and playing in a 20:80 ratio, while some swear by a 70:30 approach. First, you need to determine which you find most valuable. 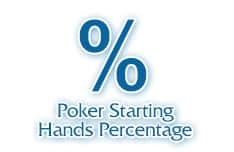 Almost every player would benefit from some study, but some players will learn primarily from sitting down and playing a ton of hands - if you tend to be more hands-on, this may be you. Others will be more academically oriented, and enjoy reading articles and doing EV problems off-table. No matter which you are, virtually everyone would benefit greatly from doing much more hand analysis than they already do, whether the hands are hands they played or hands other people played. Analyzing your own hands will be inherently more valuable because it can teach you what mistakes you are making, but it is significantly easier to fairly evaluate other people's hands. No matter what ratio you end up going for, make sure you take the time to study at least a little each week. Poker is a game of improvement over time. Your competition will improve, and if you don't do the same, you may be left behind. Always aim toward improving yourself, rather than "being the best" or some other badly-defined goal. If you don't consistently think you were a terrible player a year ago, then you probably aren't working hard enough to improve. So buckle down, get focused, and start studying.